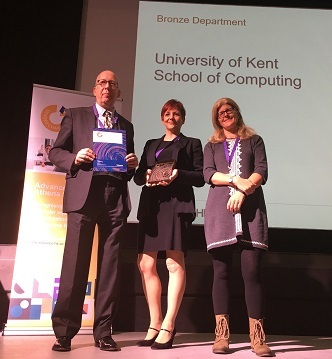 The School of Computing has been presented with a bronze Athena SWAN award for gender equality work at a ceremony at the University of Southampton. The award formally recognises the School's commitment to advancing gender equality: representation, progression and success for all, students and staff, in academic and professional roles. Head of School Professor Richard Jones, and School Administration Manager Amanda Ollier received the award at a ceremony on Monday 10 December. The award was presented by Professor Helen Beebee, Samuel Hall Professor of Philosophy at the University of Manchester and an Athena SWAN Patron. Congratulations also go to Mark Batty and his team who put a lot of effort into the School’s submission. There were also awards for the University of Kent’s School of Psychology, School of Engineering and Digital Arts and School of Social Policy, Sociology and Social Research as well as other universities and departments from across the UK.